In 1950, 43% of all households were nuclear families or married parents with one or more children. Today, that figure is 19%. In 1950, 9% of households consisted of a single person living alone. Today, that number is 28%. In spite of these shifts, American housing, which is largely focused on suburban, single-family homes, is designed far more around how people lived in 1950 than it is around how people live today. Closing the gap between how people live and how homes are designed is at the heart of Making Room: Housing for a Changing America, an exhibition presented by the National Building Museum, Citizens Housing and Planning Council (CHPC), Resource Furniture, and Clei. The exhibition is currently open and runs through September 2018 at the National Building Museum in Washington DC. 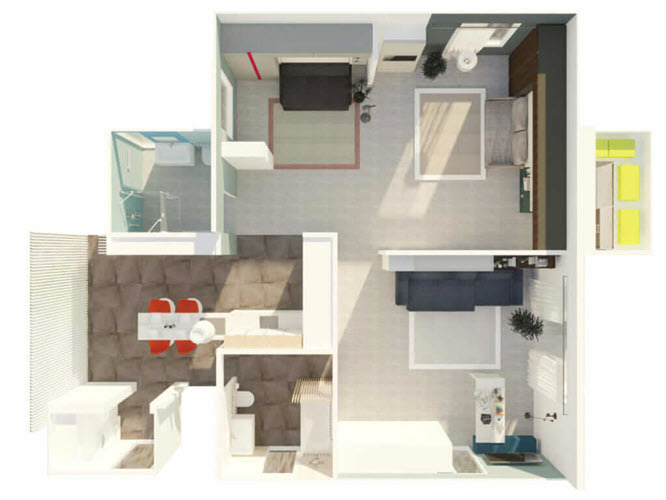 The heart of Making Room is The Open House, a 1,000 square foot demonstration home designed to accommodate a variety of increasingly common household formation types that are underserved by current housing options. During the exhibition’s 10-month run, The Open House will be transformed twice, each version supporting a different household configuration. The brainchild of architect Pierluigi Colombo of Clei, The Open House features cutting-edge products such as transforming and multifunctional furniture from Resource Furniture and Clei, moving wall systems from Hufcor, a state-of-the-art kitchen with adjustable cooking and dining surfaces from Ernest Rust, bathroom fixtures designed to maximize space from Duravit, a raised access flooring system from NewFloor with integrated porcelain tiles from Ceramics of Italy, innovative, in-wall storage systems by Protek S.R.L and many more. All of the products in The Open House were selected for their ability to provide exceptional comfort and functionality to all of the “occupants” of the home, regardless of their age or physical ability, based on the principles of universal design. Visitors to the Open House will see firsthand how good design, long-term thinking, and the right products can achieve unprecedented levels of flexibility, functionality, and comfort. According to CHPC, 20% of U.S. households consist of adults living with roommates or adult relatives, yet there is little housing designed specifically for the needs of adults living together. The first configuration of the home, on display until February 19, 2018, is designed to meet the needs of two individual roommates along with a couple. 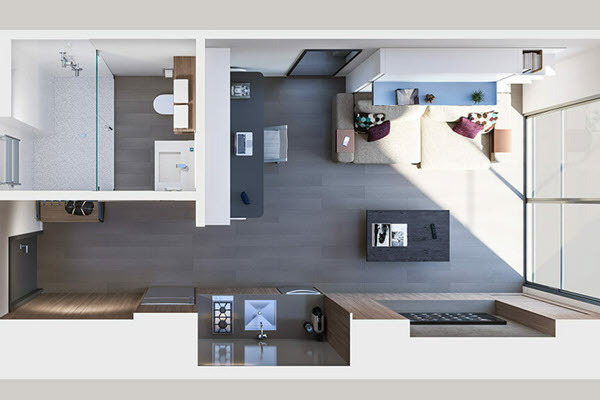 When the Hufcor automated moving walls are closed off, each of the three individual living space is private, acoustically-sound, and fairly compact–156, 215, and 263 square feet respectively. Clei wall beds are used in each room to give them dual functionality as private bedrooms and living spaces. As of 2014, 60.6 million people, or 19% of the U.S. population, lived in a multigenerational household. The Extended Family version of the Open House is designed to support this common household formation, housing a single mother, her child, and the grandmother. The home allows for fluidity or on-demand privacy as required. 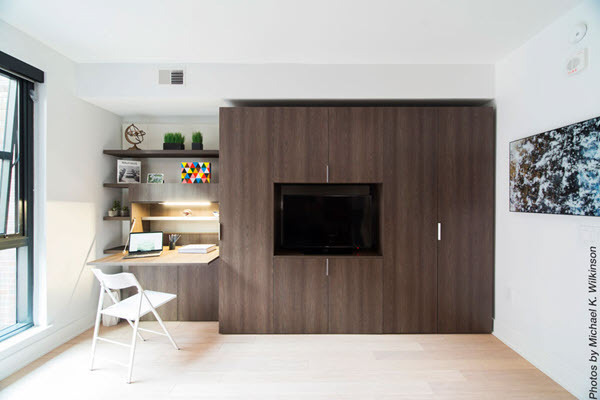 When open, the partition walls allows for a single, large living area during the day, and when closed, creates individual bedrooms for the mother and child at night. 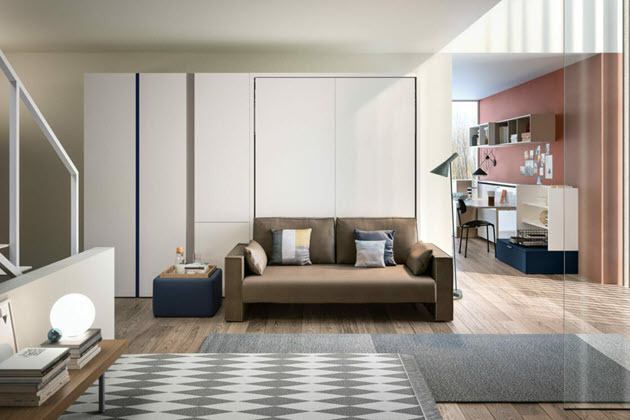 The individuated bedroom with its own bathroom gives the grandmother an autonomous space, while still remaining connected to the household. 10,000 Americans turning 65 every day and it’s projected that senior population will more than double by 2060. Accordingly, finding innovative solutions for senior housing is critical to the future of housing in America. The Retiree Open House is designed around a retired couple with a live-in renter or caretaker. 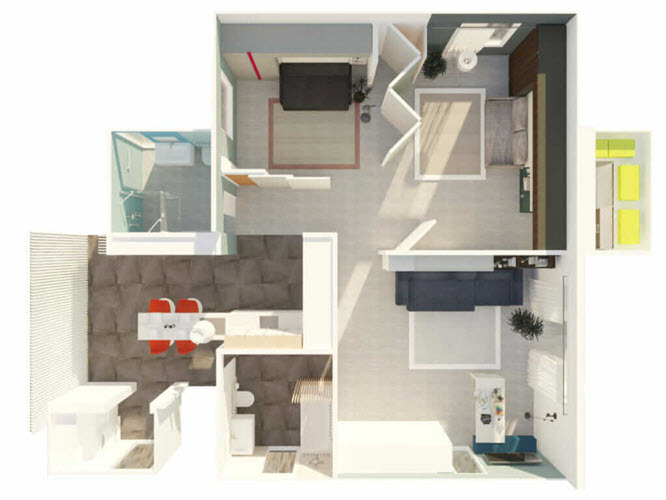 In this configuration, with the addition of a modular kitchen, the largest of the three living spaces is “locked off” from the main home and becomes an autonomous micro-studio. 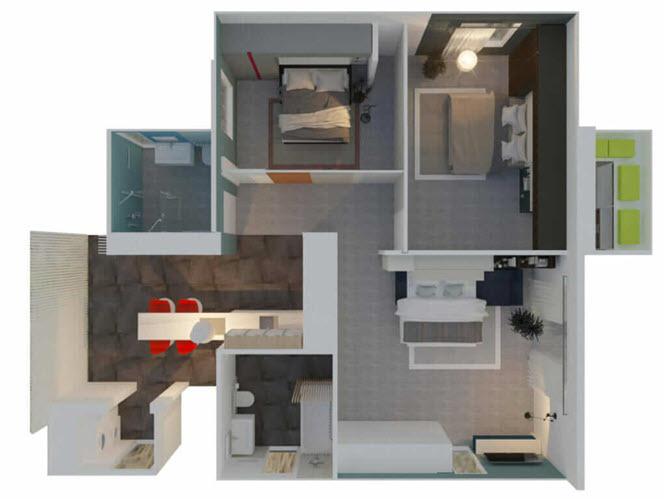 The main living area features a motorized wall bed for ease of use, and a dedicated dining area with hidden bunk beds. When the moving wall systems are closed, the dining room becomes a quiet bedroom for grandchildren sleepovers. The universal-design features throughout the house are all appreciated in this household scenario. In addition to the Open House, the exhibition highlights cutting-edge projects that housing entrepreneurs (architects, designers, and allied housing advocates and policymakers) are taking to expand our housing options, including micro-apartments in New York City, shared housing experiments in the D.C. area, backyard accessory cottages in Seattle, tiny houses that are helping the formerly homeless in Austin, and the boom in cohousing communities. For address, exhibition hours, and other visitor information, head over to National Building Museum’s website. 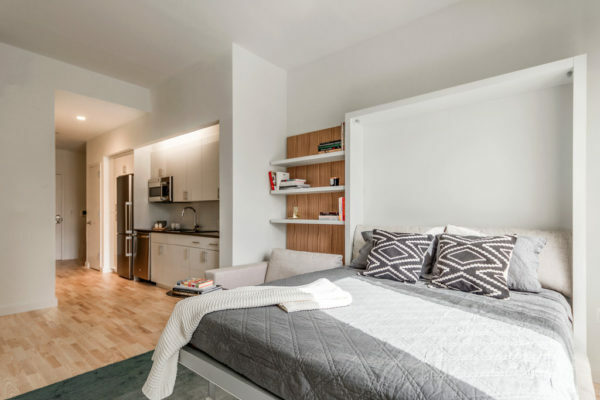 Real estate giant Forest City entered the micro-unit market with their award-winning building in Washington D.C.